- Sari Colt on 九月 25, 2018. At sunset on Saturday, Sept 29, 2018, the most beautiful spectacle will be taking place at Nathan Phillips Square, Toronto. During the 13th Annual Nuit Blanche Toronto 2018, Hendrick’s Gin‘s L.E.V.I.T.A.T.R.E. returns for the second time. This 65-foot hot air balloon will be taking up the individual golden ticket winners every hour from 7pm – 7am. L.E.V.I.T.A.T.R.E. which stands for (Levitating, Elevating, Voluminous, Illuminating, Tantalizing, Amazingly, Towering, Roaming, Eye) will soar up to 44 1/4 cucumbers ( 44.25 feet) in the air, giving Hendrick’s Gin lovers a once in a lifetime chance to get a bird’s eye view of Toronto. There will be lots of fun on the ground as well. At the Hendrick’s Gin Air Departure Lounge, the C.O.R.G.A.N. ( the Cucumber Organ of Remarkably Glorious Auditory Nirvana) will play its first ever note. The C.O.R.G.A.N uses real cucumbers as keys creating fabulous sounds. It indeed is a one of a kind instrument. Terri-Lynn Decker, a celebrated intuitive, will also give golden ticket winners energy readings. And how does one get a chance to be in L.E.V.I.T.A.T.R.E.? 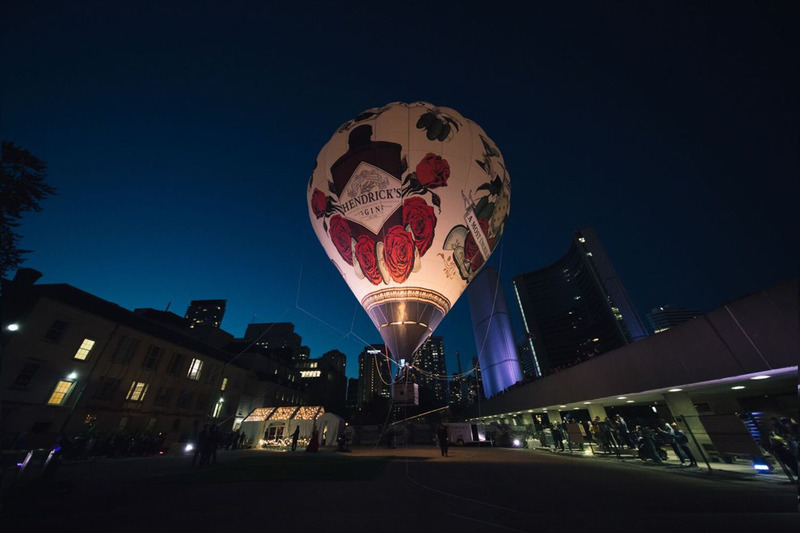 There are two ways: one can enter online http://www.hendricksgin.com/balloon, and one can visit the Hendrick’s Gin Air Departure Lounge (on the west side of Nathan Phillips Square) on Saturday, September 29 and enter to win a chance to fly. Before the 7pm departure, invited guests will be sampling Hendrick’s Gin‘s reimagined blend called Orbium. Orbium has the addition of Wormwood, Quinine and Blue Lotus Blossom to its classic mix of Cucumber, Rose and 11 Botanicals. This unique gin is “curiously odd” and will appeal to those who want a unique taste experience. Orbium is available this fall for a short period of time only, in Ontario, Quebec and British Columbia.